I got around to making a font / number system for the Planet Mover text in the book. The original was deliberately low-res, specifically because I don’t have great artistic talents, and I wanted to give no more than a general impression of what they were. For print, I really need something higher resolution. So, after experimenting a bunch with pen and calligraphy pen, I stumbled upon a basic theme that seemed to work, and did the drawing for them in PowerPoint, not so much because it has great drawing tools, but because they are adequate and I know how to use them. 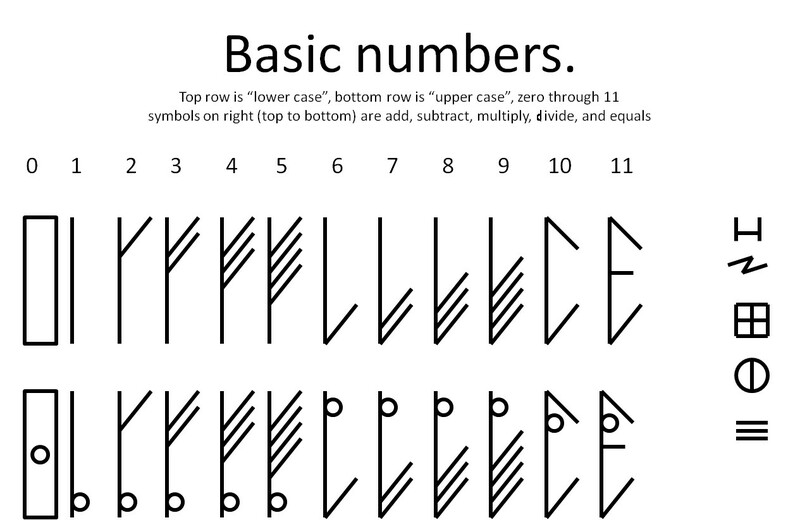 The PM message is in a constructed language (or at least the script and basic structures are), so it’s more regular and less flowing that something like Elvish. Just the numbers and basic arithmetic symbols so far. Possibly more later. Seems reminiscent of the Irish Ogham alphabet. 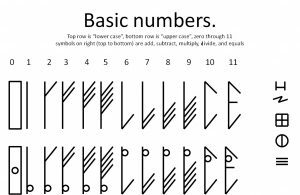 Something just occurred to me… base 12 numbers that have a systematic form (as opposed to the essentially random forms of numbers in terrestrial use) should have patterns tied to the factors of 12. So rather than a design that runs 1-5 and a variation of it that runs 6-9 with two more for 10 and 11, it should be half and half. Or 3 groups of 4. It’s a good package for doing work that will scale well for printing purposes and has a wider range of tools than PowerPoint.